Of all the figures in the first series of Transformers Classics, one choice is really odd. You've got the must-haves, like Optimus Prime and Megatron, and all the big fan favorites, like Bumblebee and Starscream. But while Grimlock, the Boba Fett of Transformers, had to wait until the second series to find shelf space, one of the first TFC figures available was a character not seen in any form since G1 - Astrotrain. Astrotrain thrives on panic and fear. Though he is mainly used as a transport vehicle for moving warriors and supplies, he only truly feels at home pounding Autobot warriors into scrap metal. His ionic displacer rifle can scramble autobot sensors, cauing confusion in the enemy ranks, and his huge bulk casts a terrifying shadow across a battlefield. Those Autobots who survive a fight with Astrotrain often need only hear the echoing boom of his engines in the distance to once again quake in fear. You notice what that bio said? "His huge bulk?" 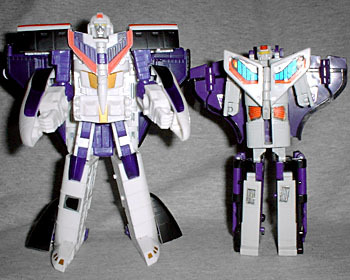 Astrotrain is supposed to be the size of a full-sized train and shuttle, and his robot form is supposed to follow suit. No mass-shifting here! 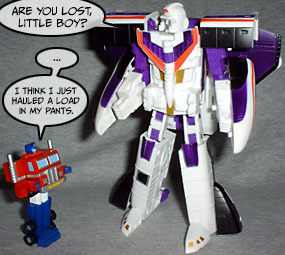 Of course, there's no way the toy could pull that off - just think of him as being in the same scale as the Mini-Cons. The robot mode is okay, but not great. He stands 5½" tall and moves at the ankles, knees, hips, elbows, shoulders and neck. The head is designed to look like the G1 version - the cartoon, more than the toy. And that's fine, because the cartoon's helmet-y look was pretty cool. Astrotrain wasn't one of those characters who turned into a complete gomer when he got animated. He still has big blocky shoulders, wings on his back and chest and a triple engine between his shoulders. Even his gun is an update of the G1 version. The colors in robot mode are a bit bland. There's a whole lot of white, with only a few spots of color - and most of those are on the kibble, rather than the robot. A silver face on a white head? Contrast, people - we need contrast! The flaps on his chest are nice, but overall this guy is whiter than Jamie Kennedy. 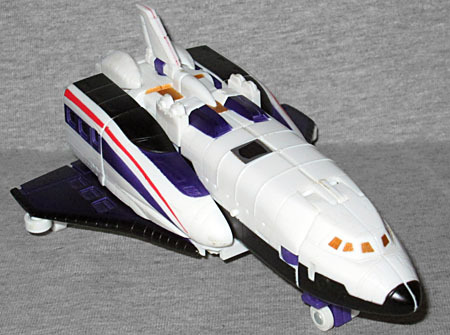 Astrotrain, in G1, was a triple changer, which means... exactly what it sounds like. He had three modes. And since his name contains the words "astro" and "train," you can probably guess what those modes were. 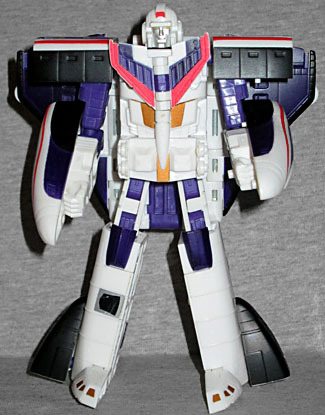 Classics Astrotrain maintains the same three modes - robot, space shuttle and locomotive - with some changes. Now, of course, you can transform between any of the three modes in any order; for this review, we're just going to go in the order of his name. To transform him to a shuttle, press his legs together. Fold down the toes, then rotate down the pieces on the outsides of his ankles. Slide the whole lower section up into the torso. Fold down the wings from his back, pull out the engine and spin it around. Open the hatch on his back, and tip his head back into it. Align the shoulder pads and the forearm kibble, and point them toward the toes. Fold the chest flaps together, bring the wings back up and raise the engine into place. The shuttle actually looks pretty good, save for two big pieces of kibble and one paint screw-up. We'll start with the good: this absolutely looks like a space shuttle, and if you didn't know it turned into a train as well, you wouldn't recognize the front of the train over the wings. It's 6" long and features real rolling wheels and retractable front landing gear. The engine detail is nice, with the main engine cluster surrounded by a smaller orbital maneuvering system. Now the bad. Most noticably, the front of the train resting above the wings. Kibble like that is just bad design. Secondly, the paint: the tops of the shuttle's wings are nearly black, and the bottoms are white. If you've ever seen a shuttle launch, you know that's supposed to be the other way around. The black heat-insulating panels face down, not up. He's going to burn up on re-entry. To convert from a rocket to a train, retract the landing gear. Fold down the engine and wings, spin the tail fin 180º and split it to lay it flat. Pull the two front halves of the train away from the sides of the shuttle, rotate them around and press them together. Turn the engine around, fold the wings down and wrap them around the back of the train. The shuttle mode is great, but the 9" locomotive is really lacking. To begin with, it's a bullet train. Why's that a problem? Because bullet trains already look like space shuttles - it's no great feat to turn one into the other, even if it's more complex than you might expect. 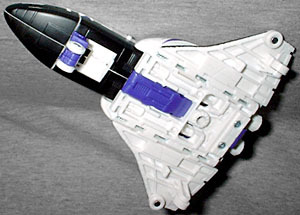 In G1, Astrotrain turned into a shuttle and an old-fashioned steam engine, and neither mode suffered. The Classics version can't claim that: he doesn't look like a complete bullet train, he looks like half a bullet train mashed up against half an unspide down space shuttle. There's a clear and distinct line where the paint switches from one to the other. If the shuttle's wings were painted correctly, maybe that wouldn't be the case: the prototype wasn't solid black, but had some purple, as well, which would have helped tie the two halves together visually. Yes, the final thing has purple on the wings, but like the Batmobile, it's so dark that you can't even tell in normal light. This review is pretty harsh, but Classics Astrotrain isn't really a bad figure. Each of his three modes is decent, but none of them are really great. Some of that could have been fixed with different paint apps, but more of it can be chalked up to the actual design. It shouldn't be the case that a figure released in 1985 has a more impressive transformation than one released at the end of 2006, but with Astrotrain, it's true. The Classics version is good if you don't want to spend much money, but for the best version of the character, hunt down the 2005 reissue.